Prospectors usually research an area before they venture into the bush to explore for minerals. There are many different types of maps at their disposal but there is one resource that many of us may not be aware of―Forest Management Plans (FMPs). The MNRF has divided much of the province's Crown forests into management units (FMUs) and each has a FMP. FMPs have a ten-year duration, though occasionally this may be extended by up to three years. They include details on harvesting locations & schedules and the location, construction and decommissioning of access roads. A map of FMU boundaries in NW Ontario, overlaid on a geology map, is provided (view map). 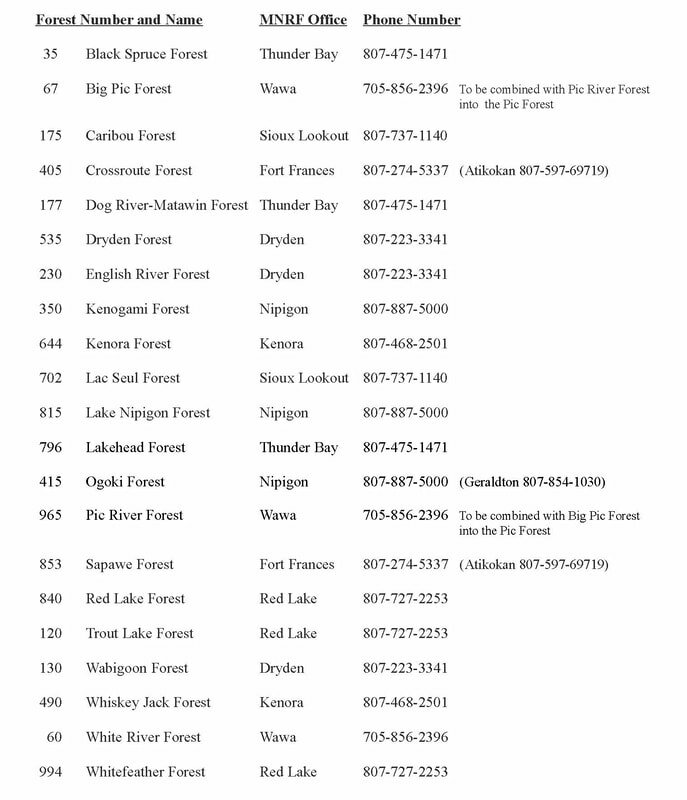 A table of FMUs, with the responsible MNRF office and telephone number is provided below. Each FMU should also have a Local Citizens Committee, the members of which are volunteers who represent land users including the minerals sector. Each FMP is under continual review by the LCC and the Ministry. To find out when a particular plan is up for renewal, contact the local MNRF district office or use the public Forest Management website noted above. To learn if there is a minerals sector representative on the LCC for your area of interest or to volunteer for such a position, contact MNRF or a member of NWOPA’s Board of Directors. The Regional Land Use Geologist (RLUG) with the Thunder Bay MNDM office can advise you regarding land use issues related to prospecting and mineral exploration issues. Call (807) 475-1663.